Delicate, sensitive, and ethereal, those born under the zodiac sign of Pisces are the gossamer souls who teach our world how to love unconditionally. One moment they may be ‘up’ and the next they may be ‘down’ but the Pisces sign stays the course in their never-ending desire to make the world a better place. The Pisces-born soul is over the moon (well, under it more precisely). With Moon as a major influence in this sign it’s not surprising to discover the Pisces sign has mood swings that frequently wax and wane like the tides. Sometimes imaginative, other times idealistic and ever thinking that the world should be something better, the fish can get lost in a stream of consciousness. Another personality trait of Pisces is that they want to save the world, but sometimes forget about the self. When that happens the fish literally sinks or swims. Those that rise above circumstance can create marvelous transformations provided they continue on a solid regiment of filling their inner well. Pisceans often live with one foot in the water, one on land and their head in the clouds so they can soak in all manner of information. This fine kettle of fish is simply part of the Pisces craving for data. While not always practical, they have very hungry minds and spirits. Feed the Piscean incredible fish tales that inspire their imagination and you win their hearts. Pisces both young and old struggle with self-image and as a result they often stoop and slouch. The remaining features of Pisceans vary tremendously but no matter their build they come across as shy, kind and mysterious. Physically speaking watch what you eat (many Pisceans love junk food) and protect your feet, especially if you work in a heavy-labor environment. The image of two fish goes back to Egyptian carvings appearing around 2300 BCE. In Greek mythology Aphrodite transformed Eros/Cupd and into a fish to escape Typhon, a monster sent by Gaia. Pan warned the Gods and then smartly became a goat fish that could swim the Euphrates. Aphrodite eventually honored the fish by giving it a space in the night sky for eternity. 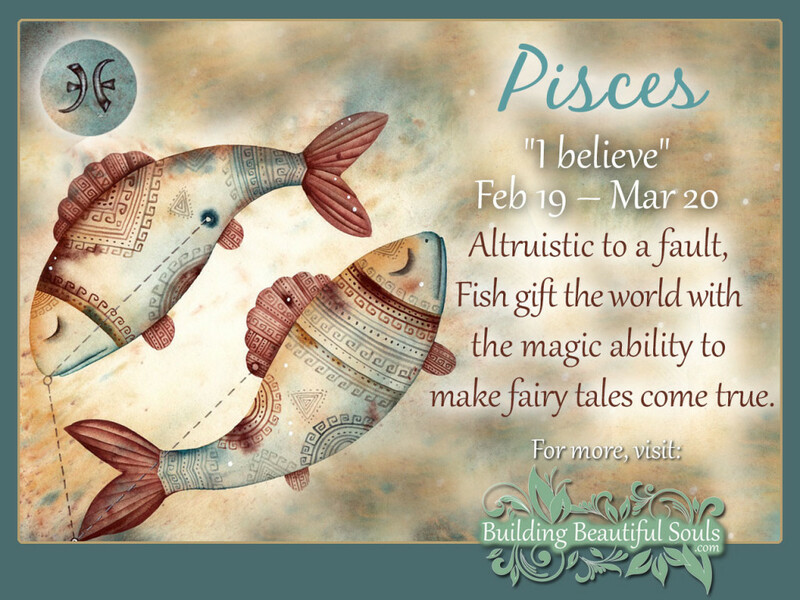 Like all fish, Pisces will swim upstream to mate, but beyond that they can be staunchly independent. This makes for disjointed and distracted relationships with partners who may not understand the coy, visionary element of this sign. The best Astrological partners for Pisces are another pleasing Piscean, the charismatic Cancer or a sultry Scorpio. No matter the choice, our fish craves the “happily ever after’ but often settles for contentment instead. Want to know more? Read the full Pisces compatibility profile. Dear Piscean Parent, get ready to take a huge plunge into an odd blend of confusion and charm. Their creative nature means it’s hard to get this child into focus, let alone into conventional clothing. Many Pisces children have an invisible friend that comes with a guidebook that only the Piscean knows. If those friends don’t like YOUR imaginary friends (come on you know you still remember them), you may find those age-old companions challenged to a duel. A Pisces mind’s eye finds novel ways to do and say things that make them uncomfortable normally. Advice: find a way to support that mystical magical element of the Fish so that they don’t shut down and loose the inner child or intuitive abilities. HINT: You will always feel like you’re around an old soul who has decided that wearing flouncy purple hats (or poke-a-dots) is perfectly acceptable, and they can tell you why. Want to know more? Read the full Pisces Child astrological profile. Pisces girls have incredibly strong emotional responses and they requires flexible parents to weather the stormy seas that can go from ecstasy to dejection in the time it takes you to snap your fingers (probably less). One smile from you puts them on the top of the world, while a frown turns life upside down. That is perhaps the hardest part for Piscean parents – realizing how much the incredibly intuitive Pisces child (girls especially) simply “know” without having to ask. Harder still, is working with an uber sensitive child who always feels like somehow it’s her task to fix all the ills and wrongs of their world. Want to know more? Read the full Pisces Girl personality profile. Pisces boys are children who generally end up being totally misunderstood. People stereotypically expect sensitivity from girls, but this little man is all heart – and one determined to walk to his own drummer. Conformity is not in a male Pisces’ vocabulary and he may not be a “book learner” (even though he loves stories). A Pisces son naturally seeks to help the underdog, making him ever late for dinner (and often with a few bruises to show for it). He is not a bully, however. The Piscean only fights when they perceive injustice or out-and-out cruelty. Want to know more? Read the full Pisces Boy personality profile. The Pisces sign has a very specific career goal – to live the dream. Pisces’ are as creative as they come and want satisfaction far more than money (although a compliment or bonus now and again makes them break into “Under the Sea”). 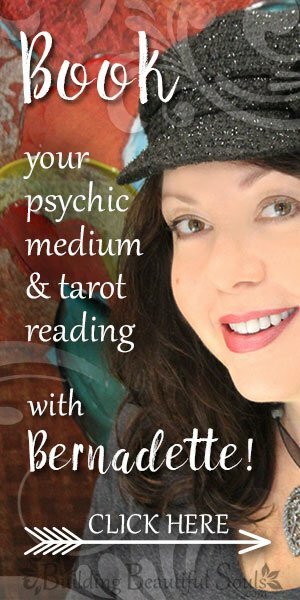 This sun sign’s dedication to goals often pushes them to amazing contributions – be it social or spiritual. However, it takes time for Pisces to find that bliss (they will literally job hop, often from the frying pan into a worse fire). Setbacks are a hard task master for the fish – they haunt current and future efforts. Pisces jobs which often bring them the soul satisfaction they seek are fashion design, acting in or directing art-house films and oceanography. Yes, the fish likes fish, but the salt water variety offers so much more vibrancy. Alternatively look to a dog like a golden retriever who will swim with your Pisces. Also small, fluffy pets appeal to the protective side of this astrological sign. Birds gotta fly… No mystery here, the Pisces sign loves water sports. The also enjoy collecting things like crystals and lava lamps – anything that sparkles and undulates like their soul home – Mother Ocean. Think sentimental: Pisces remember everything, and if you take a few cues you can collect some of the fish’s most prized memories into a photo album, collage or a simple locket. Music, seashells and living plants are always welcome. The header for the “traits, personality, and characteristics” section of this page improperly displays Scorpio as the page’s Western Zodiac sign. All the other headers and subheaders look correct. I’m sure it was an oversight, but I wanted to bring the coding error to his or her attention. That being said, this is a spectacularly wonderful and incredibly user-friendly site; full of awesome, relatable, and easy-to-understand content! Thanks! Thank you so much for catching that and taking the time to let me know! It’s all fixed! Also, thank you for the generous praise!